There are sparkling diamonds all around me reflecting the truths of life in their bits of piercing clarity, precise angles and value. The truths of life are those that speak of honor, commitment, meaning and appreciation, love and humble acceptance, among a thousand others. So precious are these truths that I am always searching for them. They elude me many days, as if they are seeds of wisdom that travel on the breezes of thoughts and come my way, yet then dash away before I can recognize them. And then there are some days that these truths, or perhaps just a handful of them, become crystal clear as they are laid out before me so that I might wonder at them. 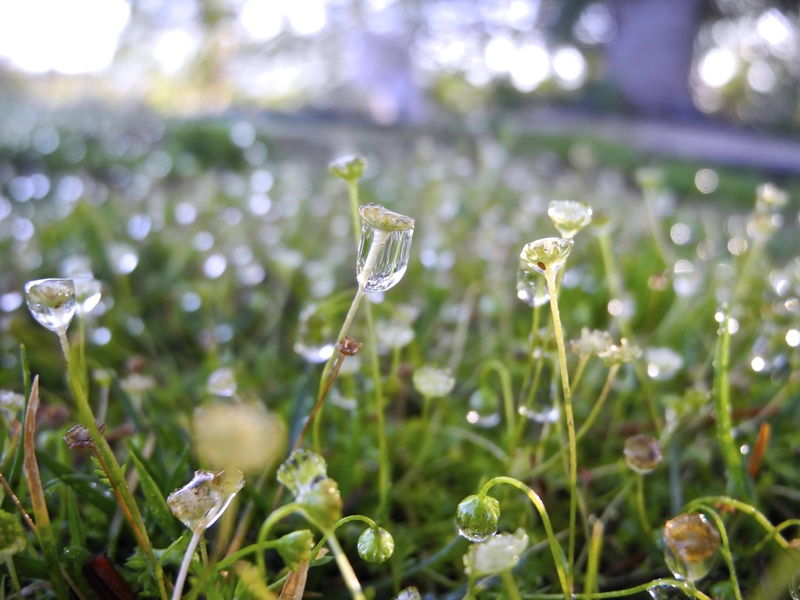 Here in the whimsical diorama of moss flowers, there are diamonds that reflect the beauty of community. They have been plucked out of the air during the night, collected en masse by the patch of green blossoms, and are suspended delicately to highlight their transiency. In this state, for just a few moments before the sun rises higher and the droplets descend to the earth, I am allowed to look upon truth and be inspired. Why did I not see this before? Was the beauty around me somehow obscured on other days? Was the truth not there? Oh wanderer, the truth was there. I lacked the vision to see it, or the key to unlock the door. In fact, I may not have even realized that I should have been looking, so unaware was I. Although the beauty of life’s truths are all around me, they are not always visible. Sometimes it takes a special need, a questing moment of introspection, or a patch of weeds to bring the truth, the treasure, to light. When my eyes are opened I can see that there are jewels around me that dazzle with their truths. There are Ricks and Roses, there are Michelles and Jennifers, there are Sarahs and Reginas. There are Helens and Stephens, Nicks and Zachs, misters and misses, children and babies. There are those with names from A to Z, of the past and present, of my dreams. There are lovers and friends and strangers and speakers that have found a truth and share it with the kind of pure light that sparkles like stars in the sky, or diamonds in the weed garden. I am blessed that my world is populated by such creatures. And I am lucky that on those days when my eyes are open enough, and my heart too, that I can see them for what they really are. Happy Weederful day to all! Thank you for writing such a beautiful piece! It added another wonder to my amazing day! Why, thank you C.B.! I am happy to oblige.